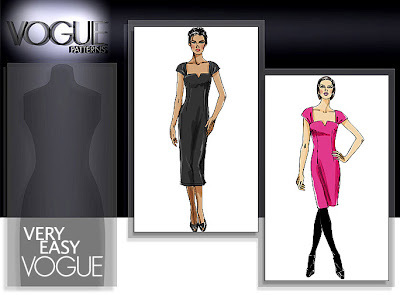 I feel a little guilty for being such a Negative Nelly in my post about the Vogue Winter/Holiday 2009 collection. Like I said, I do empathize with Vogue and the difficult position they must be in considering the current economy and dearth of people who sew. 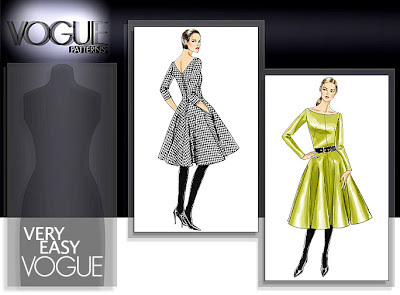 So, in celebration of the hard workers at Vogue Patterns, I would like to commend them for the three that I most enjoyed from this collection. First off is 8612, a nice sheath with an interesting neckline. Secondly, how about this lovely little number? Vogue 8615 has an appealing late-50's silhouette . . . and pockets! And lastly, let's consider 8613, a classic shirtwaist shape. Look at the cute short-sleeved variations! There! How's that for positive thinking? Bonus: they're all easy patterns - great for beginners. Did I miss any that you especially enjoyed? The neckline on that sheath really is cute! I just love sheath dresses - they are so flattering. The neckline on the sheath is my all time favorite. Did you notice though the patterns you like aren't designer? They're just Vogue? The first two were the only two that jumped out at me when I looked at that collection last week. The full-skirted one could so be vintage - I would love to have a go at it. There's something so classy about dresses with long sleeves, don't you think? Thanks for posting, Gertie! I really like the dress with the 50s silhouette...and I just noticed something incredible (! ): the dress comes with separate pattern pieces for cups A,B,C,D (the sheath dress does too). I don't know if you ladies out there have the same problem, but I have a pretty normal body shape but a cup D and as far as I know all commercial patterns only come in cup B. This means I always need to change the pattern to fit me and I'm often too afraid to sew fitted dresses, like this Vogue dress, or blouses from a commercial pattern because they end up too tight or the neckline is too wide or other weird and non-flattering-looking things happen to my chest area. Therefore I often end up drafting from scratch, which is a lot of work! But I could actually sew this dress straight up, so I'm thinking I might try! Do any of you know other sewing pattern companies, that provide patterns for different cup sizes? Is this normal for Vogue patterns? I have never sewn from a Vogue pattern before. Let me just say (and I should have posted this on the last one) that I agree those other patterns are ugly, but there are a group of ladies that go straight to those designs. I'll be sitting flipping through the pattern books at Hancock's and they're all abuzz about the latest Marci Tilton or some such. I think they're the same ones making "wearable art" pieces that would be much better served hanging on a wall, but Vogue is just serving their clientele what they ask for. We need to get more stylish young ladies sewing so that more patterns are released for our demographic! Simplicity is trying it with the Project Runway and Cynthia Rowley patterns, and I hope it'll catch on further. They are all nice, but I adore Vogue 8615.
stephanie, I've noticed other companies doing the same thing with different cup sizes. A McCalls jacket and a Simplicity blouse I have are the same. I think it's great! Even though I don't have to do any bust adjustments for the major pattern companies, I've always thought it must be a huge pain for those that do. Hanna, I've been coveting long sleeved dresses lately. Wouldn't 8615 look nice in a black matte silk? Gertie I dont think you were being a "negative nelly." Based on the response to that last post I think we can all agree that the Vogue patterns are not the most attractive visual-wise. And I think when we see the "Vogue" name we automatically think fabulous fashion, ie the magazine. There ARE women that believe the patterns look attractive enough to buy but I think Vogue is missing a huge market- us! Us women in our teens, 20's, 30's, 40's who sew clothes because we want to be up on the latest trends or just cant afford that Anthropologie dress. And I think Vogue really fails in delivering in the arena! Thank goodness we are imaginative, creative women (like you!) who can figure out how to make these fabulous! I like the shirt dress pattern but it's one where they've split the sizing in a funny way so I can't buy it. I'm not a fan of the sheath dress, I think the fact that they drew it on a Victoria Beckham looking model puts me off totally, that and I don't have the figure for that type of clothing nor the need for it! I think I added 3 patterns from this collection to my 'want to buy' list. I love the first pattern on your post. It seems very versatile. I would even raise the back V line for a more fitting day dress. Simplicity has their Threads patterns which have the various Cup sizes. Love when they come in different sizes. When I have to do a fba, I feel like I might be distorting another area on the pattern. I, too, am glad to see more cup-size options - I'm an AA, and have yet to get SBA's down pat... Strangely, vintage patterns tend to fit much better than modern ones, so I imagine they would be harder to fit for some better endowed than I. Anyway - good to see pattern companies making it easier for all sizes to sew! As to the new patterns themselves - if you completely ignore the awful fitting garments on the models, there are some fairly decent line drawings. V1141 (http://www.voguepatterns.com/item/V1141.htm?tab=list/whats_new&page=all) for instance. Awful, awful looking on the model - but the line drawing has potential! V8623 has a cute jacket - not that I'll be buying that pattern, but I do like jackets like that. I love the collar most of all. 86922 is the bolero - I could see myself making View C - but not shelling out $3.99 for it. I actually adore the newest Vintage Vogue patterns - not as exciting as some of the other VVs, but that's just what I've been in the market for lately. Simple, but still with nice lines, and little surprising bits (like the back detail on 1146) - and 1137's coat just screams "cute art student" to me, so I think I just might have to make it. @stephanie: McCall's seems to be putting one out with every new series of patterns. They are called Made-for-You: 5923, 5927 and 5971 are on my wishlist that's why I have the numbers. Hope you read this and HTH! I was a big fan of that center one, too. Interesting modern lines in a 50's silhouette. But I was rather surprised that you weren't so into that green, belted sheath from their vintage collection! Yeah, it was basic as all getout, but such a classic! In response to stephanie I know that the Threads collection by Simplicity does the different cup sizing. and as for the vogue collection, there were some great things, but overall it was hit or miss for me. Hey there! I know this post is a bit old news, but I've only just today been going through the new Vogue patterns (they're on sale this weekend!) and I absolutely adore V1133, V8621, and V1151. They're all so fun. Especially the first two, with the cutouts.